My favorite products for the vacation & the beach - Cherry Colors - Cosmetics Heaven! It's no secret that I went to the seaside for a long period aka it's the time for a long and lovely vacation. But which products did I take with me to the vacation and which ones go with me to the beach? Find out in my post. Keep in mind that these are also my Summer favorite products :). To the seaside, I only took the products for which I know I would use them regularly or at least I wanted to use them regularly. Cvetka Bye Bye Cellulite - This is an anti-cellulite cream that reminds me of a product I had years ago. It has the same green color and the same scent, but this cream is more of an oatmeal since it's so thick and oily. But you know what? It works amazingly well for cellulite and helps with my massage with my little "torture device" because it's so thick and oily. Love! Afrodita SOS Tropical Spray - I actually took two of these with me to the seaside since here's an infestation of mosquitoes. All the times there's these damn little blood sucking creatures. The scent it strong, but it does its job well. Balea Oil Makeup Cleanser - I took it with me because it's amazing. There's no need for other such products when I have it. It cleans all the makeup - even the waterproof mascara and eyeliner. I already got a backup and I couldn't be happier with it. Except that, it is being discontinued. Alpstories Argan Oil - It's great as a skin moisturizing agent after a shower (we all know what sea water does to our skin) and to use on my hair tips. I love to use it for the days my skin feels extra dry and in need of a boost. Afrodita SOS Calming Gel - A product that is to be used after mosquito bites, jellyfish stings, and sunburns. I used it on my kid after a very mild sunburn (who the heck knew he would get burned after running around the house ad 6 pm?) Anyway, the redness went away overnight after I used the calming gel on him. Amazing! Of course, it does wonders for mosquito bites! It's a must have for Summer. What's in my bag when I go to the beach? This is a little bonus for you all. 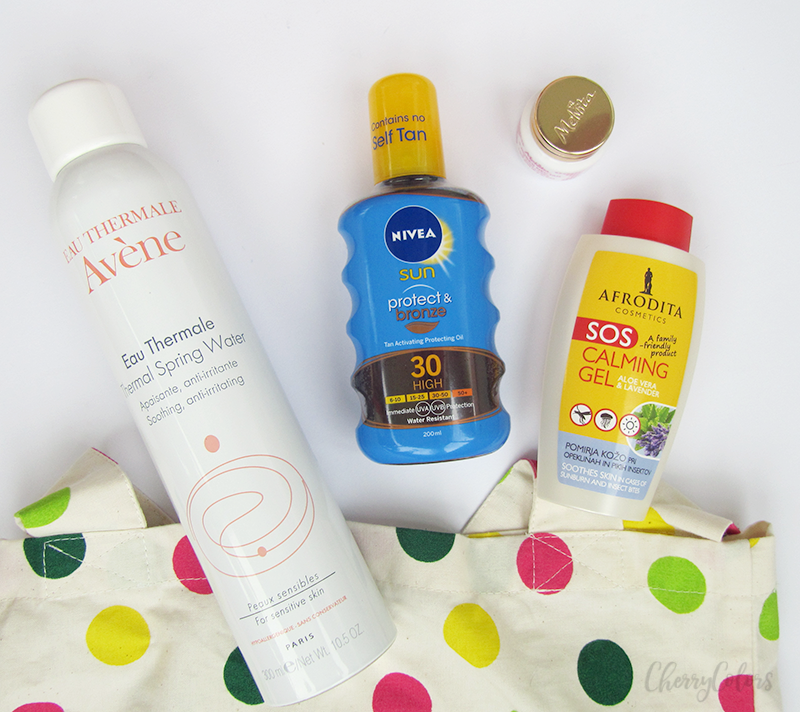 My top 4 products I take with me when I go to the beach. Avene Thermal Spring Water Spray - This is a great little refreshment during a hot day. On humid days it makes things worse, but on dry, warm days it's the best. 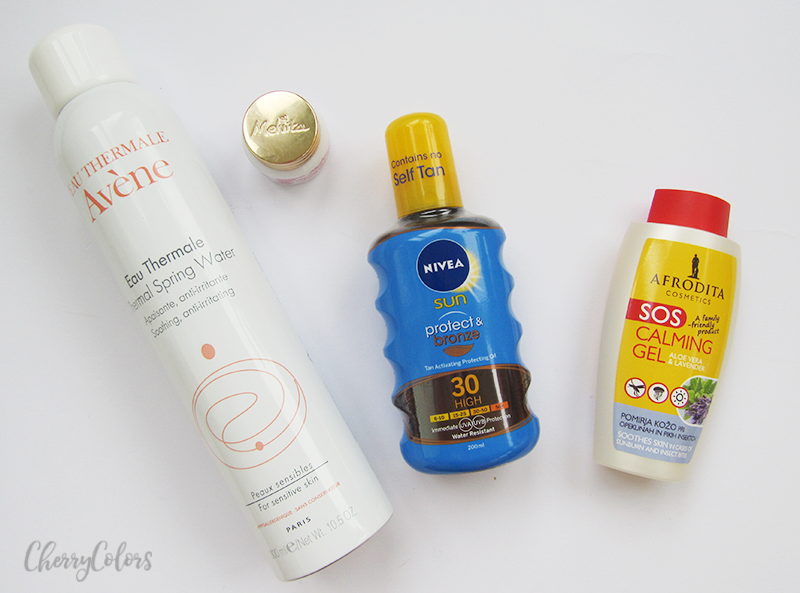 Nivea Sun Protect & Bronze SPF 30 - I can't live without sunscreen. And especially on a beach. I am now using this version since I used half of my kid's sunscreen in a week. Whoops. It's still good, just oilier since it's an oil based sunscreen. Afrodita SOS Calming Gel - I take it with me in a case of a jellyfish sting or maybe that annoying mosquito bite that gets irritated after some salt water. A lovely product overall. Melvita Rose Lip/Body Balm - I use it as a lip balm and since the sea can make your lips rougher I like o use it whenever I can. It has a light rose scent (nonartificial) and feels quite heavy on the lips but at the same time, it's very lightweight. 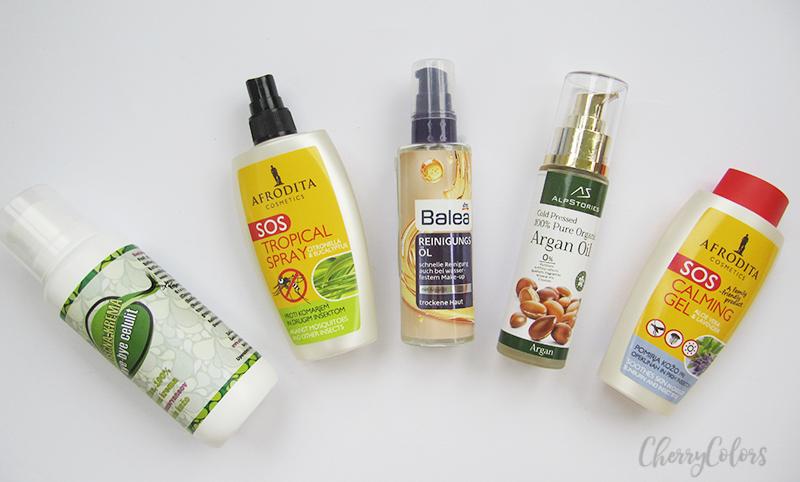 Which are the staple products you take with you to the beach?